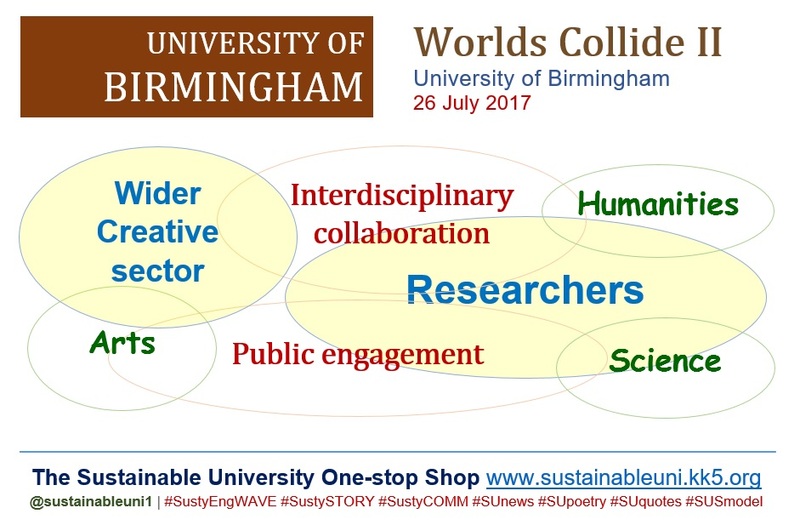 WORLDS COLLIDE II, a networking event designed to foster interdisciplinary collaboration and public engagement with research between the research community of the University of Birmingham and the wider creative sector, will take place at the University on 26 July 2017 from 9.30am to 2pm. This event will bring together University of Birmingham’s researchers from the arts, humanities and sciences with artists, creative practitioners and cultural organisations from outside. To help potential collaborators think through ground rules and guidance for developing mutually beneficial projects of public engagement with research. This informal event will provide the participants with opportunities to work together to make public engagement with research exciting, effective and extraordinarily different. The event is free to attend but prior registration is required (link below). 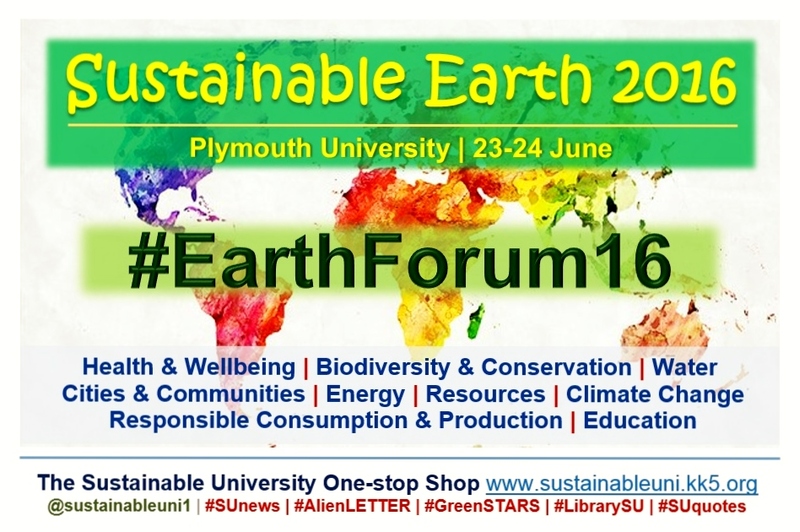 Sustainable Earth 2016 Forum (#EarthForum16) will take place at Plymouth University on 23 and 24 June 2016. Organised by the university’s Sustainable Earth Institute (formerly Institute for Sustainability Solutions Research ISSR), this global forum for connecting research with action will bring together researchers, businesses, community groups and individuals with the aim of sparking and encouraging collaborations for a sustainable Earth. The theme ‘Education’ under Session 3 will feature Professor Stephen Sterling (Professor of Sustainability Education, Plymouth University). At this forum, delegates will enjoy the opportunity of taking part in a variety of reflective activities ranging from a visit to a solar farm to a tour through the universe. They will also hear from leading organisations including Salvation Army, Environment Agency, Plymouth Energy Community, Westcountry Rivers Trust, Langage Farm, University of Iceland and Plymouth University. The first day’s conference dinner will be followed by a talk by poet Matt Harvey on ‘The power of poetry for provoking participation in Sustainability’ and then evening musical delights by The Q-dettes. Sustainable Earth 2016 Forum builds on five years of previous sustainability events held at Plymouth University. The colourful world map graphic is from The Sustainable Earth Institute. January 2016 saw two great walks by three Tim’s. The first is the well-known space walk by two astronauts Tim Peake and Tim Kopra, which lasted for several hours. The second walk, more down-to-earth though not so well-known, was launched by a group led by Professor Tim Jackson and will last for a couple of years. 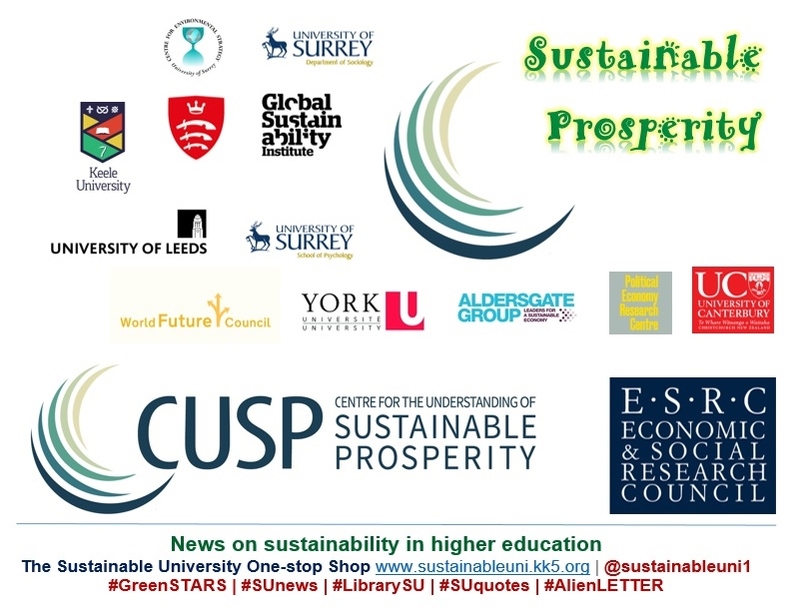 The Centre for the Understanding of Sustainable Prosperity (CUSP), a multi-disciplinary centre led by The University of Surrey and funded by The Economic and Social Research Council (ESRC), launched in January 2016 its journey of researching the way for a sustainable prosperity. Its overall aim is to explore the economic, ecological, social and governance dimensions of sustainable prosperity and to make concrete recommendations to government, business and civil society in pursuit of it. CUSP’s guiding vision for sustainable prosperity is one in which people everywhere have the capability to flourish as human beings – within the ecological and resource constraints of a finite planet. Its work will explore not just the economic aspects of this challenge, but also its social, political and philosophical dimensions, paying particular attention to the pragmatic steps that need to be taken by enterprise, government and civil society in order to achieve a sustainable prosperity. Systems analysis to explore narratives of sustainable prosperity. A unique cross-theme case study to develop An Economy That Works. A collaboration on sustainable finance with a coalition of thought leaders including the Aldersgate Group. A new Sustainable Prosperity Dialogue: a public engagement process which reaches out to a wide, international participation from research, policy, business and civil society. The CUSP takes the form of a rich international network, drawing together expert partners from academic and non-academic institutions as co-producers of the work programme. 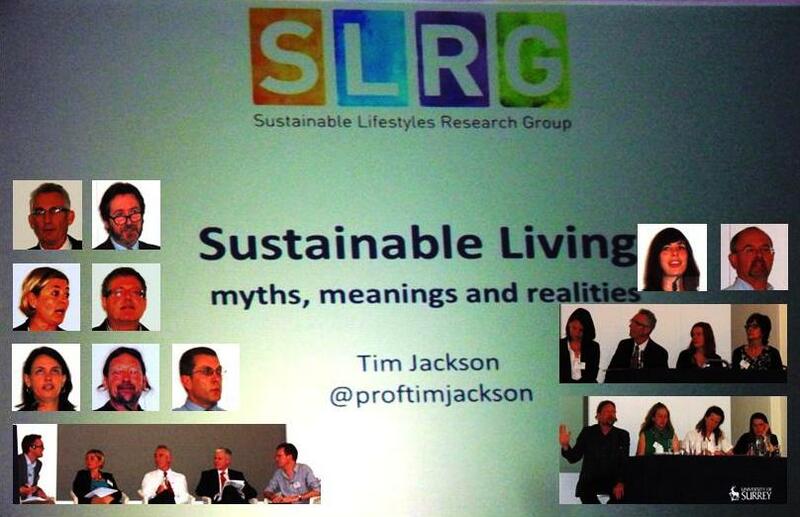 Its research programme is coordinated from the University of Surrey under the direction of Professor Tim Jackson. CUSP’s academic partners include: University of Surrey, Anglia Ruskin University, Keele University, Goldsmiths College London, University of Leeds, Middlesex University, York University (Canada), University of Canterbury (Christchurch, New Zealand). It has also established a vital link to industry and policy by including the Aldersgate Group and the World Future Council. The former is an alliance of leaders from business, politics and society that drives action for a sustainable economy; the latter is an NGO working closely with business leaders to envision An Economy That Works. The centre will widen this collaboration still further through an international network of CUSP Fellows hailing from a variety of academic and non-academic institutions. Note: This post is based on the content of the CUSP website. Logos in the graphic are also from the CUSP website. 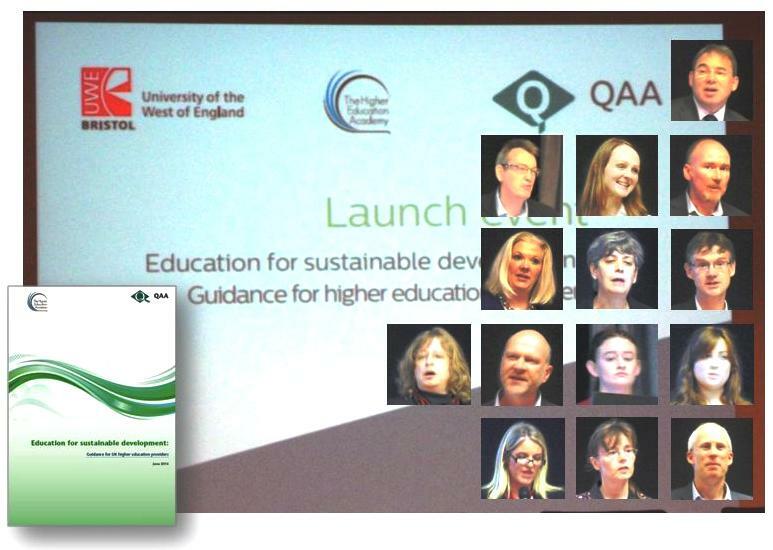 Education for sustainable development: Guidance for UK higher education providers was formally launched at the University of the West of England (UWE) on Friday 17 October 2014. This one-day event that attracted around 100 delegates was jointly hosted by The Quality Assurance Agency for Higher Education (QAA), the Higher Education Academy (HEA) and UWE. This ESD Guidance, published in June 2014, was developed by QAA working in partnership with the HEA, with the help of an expert advisory group chaired by Professor James Longhurst and co-convened by Dr Laura Bellingham and Simon Kemp. An earlier version of the guidance was subject to public consultation between November 2013 and January 2014, which also included a consultation event. The event started with a brief introduction to the day by Professor James Longhurst (Chair of the QAA/HEA ESD Group and Assistant Vice-Chancellor for Environment and Sustainability UWE). Welcoming the delegates, Professor Steve West (Vice-Chancellor, UWE) emphasised that, although embedding ESD in the curriculum is not an easy task, it is important to do so because ESD directly concerns the future of our children and grandchildren as well as our planet. He revealed that UWE is engaging students in ESD via both the formal curriculum and extra-curricular activities with the help of the students union. The morning comprised two panel presentation/discussion sessions. Panel one introduced the purpose and expected use of the Guidance. Panel 2 was a respondents’ panel of an academic user, a professional body and student representatives. In the afternoon five parallel workshops gave the delegates an opportunity to explore working with the new guidance within their own institutional context. Dr Lindsay outlined the origins of this ESD Guidance, namely the HEFCE-funded two-year Quality and ESD project Leading Curriculum Change for Sustainability: Strategic Approaches to Quality Enhancement, operated through an institutional arm (a consortium of five universities comprising Gloucestershire, Aston, Brighton, Exeter and Oxford Brookes) and a sector arm (working with QAA, the HEA and an Expert Advisory Board chaired by Anthony McClaran, CEO QAA). Among other things, this project organised a national conference in July 2012 and developed an online resource titled ‘Guide to Quality and Education for Sustainability’. When the project came to a successful conclusion in September 2012, the sector decided to build on the good work and the eventual fruit was this ESD Guidance. Observing that ESD is not a single degree subject but one that is taught across and outside the curriculum, she highlighted that it is one of the educational themes in the UK Quality Code for Higher Education that cuts across academic disciplines. Turning to the public consultation on the Guidance, she revealed that the feedback on the initial draft was wide ranging with much debate on several aspects, including the definition of sustainability, use of examples in the document, inadequate coverage of equality and social justice and concerns of prescription. These have been taken into in the development of the final version, she said. Responding to a query on whether the Guidance is mandatory, she said that it is not but added the expression ‘mandatory by stealth’! Professor Levy outlined the expected use of the guidance for strategic and individual enhancement, innovation and CPD – for example in embedding ESD in curriculum, co-curriculum and extra-curricular activities; in discipline-specific and interdisciplinary learning focusing on ‘big challenges’; and in informing joining-up of enhancement agendas (e.g. employability). She stated that ESD is relevant to HEA’s all four workstreams, namely curriculum design, innovation pedagogies, student transition and staff transition. She said that the Guidance would inform HEA enhancement activity in a variety of ways, e.g. HEA’s commissioned research (fifth NUS survey of student attitudes and perceptions around ESD), ESD strategic enhancement framework and toolkit resources and Green Academy change programme 2015-16. Her particular mention that the Guidance would inform the Green Academy programme must have reminded some of the audience the successful Green Academy 2013-2014, including the recent seminar/workshop series. Stating that a strong feature of the guidance is that it is not prescriptive, she said that commitment to ESD should come within enhancement and teaching excellence. Observing that higher education is co-created, she expected that the Guidance would be used in the same spirit. Andrew Smith said that students wanted ESD in the curriculum and it was good to see the Guidance emerging in response. He praised the Guidance for its clarity and inter-agency collaboration. Revealing that sustainable development is now a core of HEFCE’s work, he outlined the progress of the forthcoming HEFCE Sustainable Development Framework, which comprises three sections: Reducing the environmental impact of the sector, creating a model sustainable economy, and engaging students. Last winter, the initial draft was subject to a public consultation, which included two events and webinars and also saw students being invited to a HEFCE consultation for the first time. He believed that the HEFCE SD Framework, to be published in November 2014, would provide a solid support base for higher education’s other sustainability-oriented efforts such as this ESD Guidance. 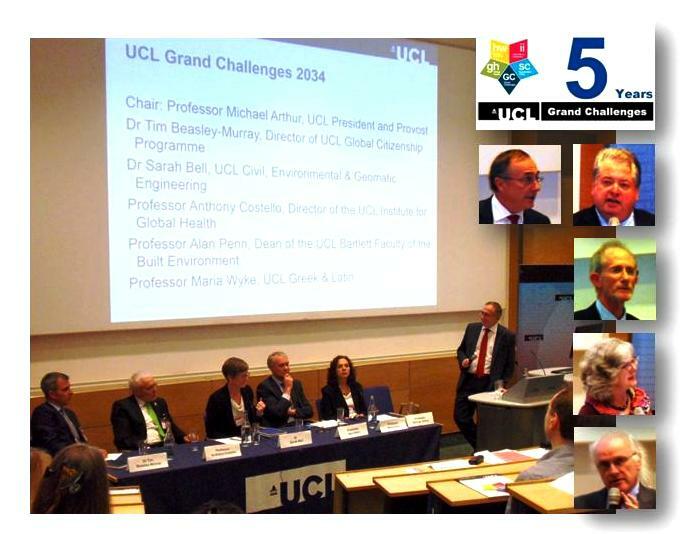 He was also of the view that UK is leading the world in sustainability in higher education. Asking whether the ESD guide would make any difference, Chris Willmore looked at its potential impact on three types of institutions, namely green, keen and grey, and argued that the biggest impact would be on the middle group, the keens. She observed that this guidance would give permission and validity for ESD to move up the agenda in UK higher education while nudging creative ESD journeys at universities. However, she said that if it was made mandatory, it could become tokenistic. She also declared that this was the first QAA document that allowed academics to have fun. Welcoming the symbolic leadership from QAA and HEA on ESD, Iain Patton saw the guidance as a stepping stone and said that its value lies in the impact on quality. Are graduates ready for the complexity in the outside world? he asked. He observed that the Guidance would be capable of crossing the Rubicon between curriculum, campus and community and would help institutional leaders see opportunities and be empowered. However, he feared that the Guidance would not work properly if it was made a tick-box exercise. He felt that the time was right for the sector to step up the sustainability agenda and proposed that ESD enthusiasts should hold a sustainability summit now. Hannah and Laura-Kate stated that NUS-HEA annual survey on students’ attitude towards sustainable development consistently demonstrates that they want sustainability in the curriculum. They emphasised that, because employability links with sustainability skills, the former could be used to engage students with ESD. Moreover, they elaborated on the UWE Green Leaders programme. In the afternoon five parallel workshops gave the delegates an opportunity to explore working with the new guidance within their own institutional context. They selected a workshop depending on where their institution was in its ESD journey, i.e. starting to address ESD, some way along in its ESD journey, or more advanced in its ESD activity. The last two points on ‘What Next?’ resonated the thoughts of ten (hypothetical) staff from UK higher education on supplementing this ESD Guidance. With the ESD Guidance, it seems that UK higher education has a bigger opportunity in using sustainability as a vehicle to position itself at the pinnacle of global higher education…. Education for Sustainability (EfS) is in the process of enriching the curriculum and student learning experiences at the University of Gloucestershire, said Professor Daniella Tilbury (Dean and Director of Sustainability at the University of Gloucestershire) at an EfS workshop, titled ‘Turning tides in Education for Sustainability (EfS) across higher education,’ held at the university on 2 July 2014. 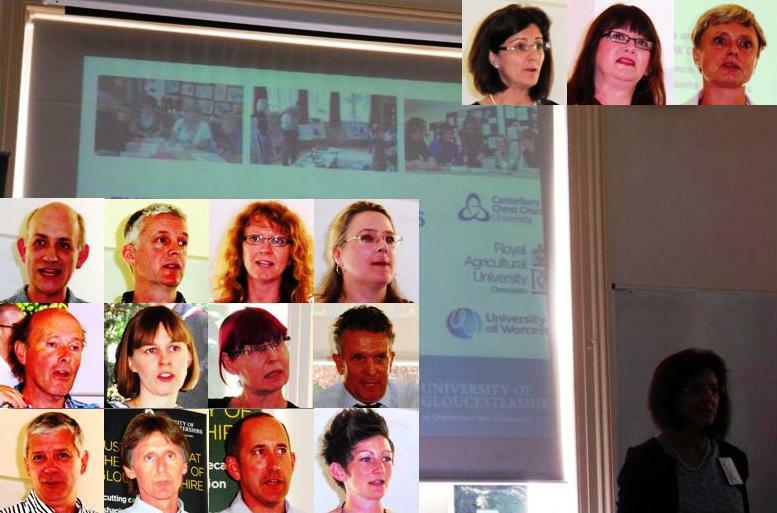 This annual event shared the experiences of EfS projects at the University of Gloucestershire (UoG) and EfS innovations in educational thinking and academic practice at several other UK universities. The day began with a welcome and introduction to the day by Professor Tilbury, who briefly outlined EfS at UoG and its Learning for Sustainable Futures Scheme (LSFS). Launched in 2012 as part of the university’s approach to enhancing the quality of learning and teaching across all subject areas, the LSFS is a collaborative initiative between the university’s Sustainability Team and the Academic Development Unit. Through an annual call for project proposals, this scheme provides staff with grants to lead and develop new projects to embed EfS approaches into the curriculum and student learning experiences. Maureen McLaughlin (Dean of Quality and Standards, UoG) spoke on ‘Futures for EfS: Quality Assurance Agency (QAA) and institutional responses’. Having realised students’ concern for sustainable development, UK higher education sector bodies have responded accordingly. For example, in June 2014, the QAA published an ESD Guidance for higher education providers in the UK. Chapter B3 of the UK Quality Code for Higher Education (the Quality Code) on Learning and Teaching identifies education for sustainability (or ESD) as an educational theme that cuts across academic disciplines and sustainable development will become a one of the themes of QAA review of UK higher education institutions. Before moving to the sessions, Professor Sharon Turnbull (Leadership Trust), chair of the event, outlined the focus of the day, i.e. EfS, Change and Organisational Cultures. Fashioning a new Curriculum: designing EfS into Fashion programmes | Nick Sargeant (School of Art & Design, UoG): Creating a programme-wide approach to EfS, this project aims to embed EfS approach into the design and development of the new Fashion Design curriculum in response to the industry’s need for skills and leadership in sustainability. It strives to ensure that EfS approaches inform the learning process at all levels, ranging from creative expression and design skills to self-direction and professional responsibilities. Using EfS through Online Learning in Philosophy of Religion | Dr Roy Jackson (School of Humanities, UoG): Focusing on Islamic philosophy as part of the design process for a new Masters programme in Philosophy and Religious Thought, this project seeks to engage students with EfS to support learning processes associated with the endeavour towards more sustainable futures. It also explores ways in advancing EfS in flexible learning environments and in distance learning and also using digital technologies. Designing Sustainable Futures: EfS and Product Design | Dr Michelle Williams (School of Computing and Technology): This project aims to embed EfS principles in the new BA/BSc Product Design courses to facilitate students’ development of sustainability competences, which would be reflected in specific skills and expertise and graduates’ professional responsibilities. It also strives for deeper understanding among students on how sustainability informs a range of aspects in design, including design thinking, human factors and responsible professional practice. The first project: Drawing on the sustainability-related learning and skills of the university’s Sports Malawi outreach initiative, the project ‘Malawi and beyond: Transformative global learning in sports for development’ aims to transfer these insights and learning processes to the Sports Development curriculum using EfS approaches. This project, which gives students work experience in Malawi, is a unique example of bringing co-curricular learning into the formal curriculum. The second project: With a view of meeting the growth in industry professional development needs around sustainability in sport, the project ‘Changing the game: Education and learning for sustainability in sport’ aims to build the capacity of the teaching staff in the Sports and Exercise department to enable them to respond to sustainability in the higher education curriculum, placements and outreach. It is also employing sustainability as a cross-cutting agenda that connects the different areas of work in the Department, including health and wellbeing, community building and social change, and global connectivity and local engagement. Social Learning for EfS: the Open Voice initiative | Bruce Goodwin (Senior Chaplain, Student Services, UoG): With the ambition of creating new spaces at the university for informal and social learning among students, this project supports the creation of Open Voice, a ‘Public Square’ initiative that facilitates debates around issues of life, faith and meaning while connecting with sustainability values and concerns. This student-led project, which brings together students, the Chaplaincy and the sustainability team, is a unique attempt to bridge the faith and sustainability agendas in a higher education setting. EfS Competencies Portfolio for Students | Richard Millican and Tim Morgan (Institute of Education and Public Services, UoG): Drawing on a UNECE (United Nations Economic Commission for Europe) European educator competences framework in EfS, this project aims to develop a portfolio for students in Education Studies to demonstrate and validate their development of EfS competences. It is one of the first attempts to use this competence framework to embed EfS in higher education programme level as well as a unique step of transferring the framework into a professional portfolio for students. Student Voices for EfS in the Business School | Meg Baker (Green Fund Research Co-ordinator, Student Union, UoG): This project aims to strengthen the student voice in the development of EfS in the university’s curriculum with a specific focus on the renewal of the Business School and position of EfS in future academic strategy and curriculum development in Business subjects. It is an exploration of how students can influence the shaping and planning of their learning experiences. The event ended with a session of discussion groups on ‘EfS futures – the role of students and sector bodies in the future of EfS in higher education,’ followed by a plenary discussion.